The Sony Cyber-shot DSC-HX400V Digital Camera with Free Accessory Kit from B&H combines this extremely long zoom compact camera with a memory card and a holster bag. 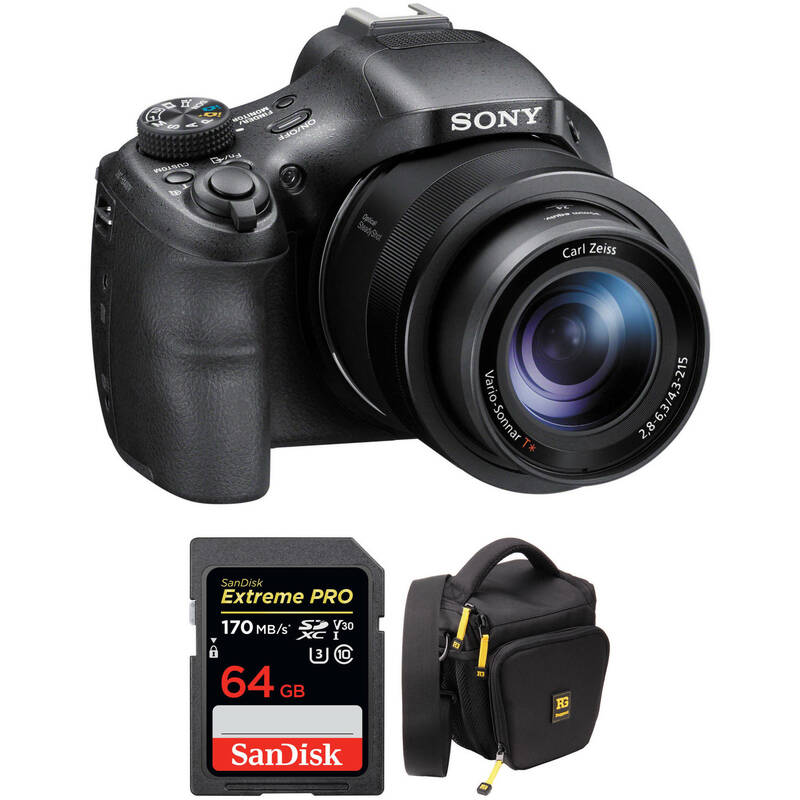 Cyber-shot DSC-HX400V Digital Camera with Free Accessory Kit is rated 4.4 out of 5 by 143. Rated 5 out of 5 by David from I am amazed with this camera after 60 years as a shutterbug I have been using cameras for over 60 years. My equipment range from top end SLRs to compact point and shoot. I own lenses from 10mm to 600mm. I have been shooting with this camera exclusively for the past 2 weeks. I am amazed by the quality of my photos. For many years the generally accepted concept that only a large sensor and a prime lens were worthy work tools. The advance of the photo camera and lens technology has shortened that distance between just primes and zoom lenses. This camera is a worthwhile camera to own and use often. I really like the automatic switch over from screen view to electronic eye level viewfinder. Rated 5 out of 5 by Switchback from Great Travel Camera Most superzooms are small with poor image quality, not so with the Sony. This camera exceeds the others in image quality and produces clear shots from corner to corner. The camera is SLR sized and feels great in your hands. Zoom range is incredible and you always have the right focal length. Sony sensors produce great results and this 20mp sensor looks better than the 12-16 mp of the competition. If you want a vast range of focal lengths, this is your camera. If you want a good zoom range with the best possible image quality the Panasonic FZ1000 may be your camera but the Sony is close with more zoom. It all depends on your needs. Rated 5 out of 5 by Capn from Simply one great camera! I received the camera about a week before spending a few days in the Rocky Mountains of Montana and the Flathead Lake area. It was on-the-job training, but the camera performed very well. We were purchasing a home and took detailed pictures of the house--including plumbing, boiler lines, data cross connects, etc; property-- including gardens with berries and flowers, trees, the lake, etc; and family. Daytime and nightime pictures. Despite myself, the camera produced some great macro, normal, and telephoto range shots. Even tried a few of a thunderstorm from a moving truck whiuch turned out quite well. So far, raqther impressive camera!! Rated 1 out of 5 by Rodolphe from Read before purchasing: Out of order after less than 3Y The DSC-HX400V is a bridge unit very versatile, pleasant to use, the zoom is very nice for animal or nature photos at great distance, the LCD repositionable is a plus. Unfortunately after less than 3 years of use the stabilizer breaks down, making it impossible to take sharp pictures. Thousands of users on the Internet have the same problem, see for example http://sony-e-62-10.tk/ or look for E: 62: 10 on the Internet. If I had known I would never have bought this model. For many users it is a hidden defect or a problem of obsolescence programmed which Sony refuses to follow up despite the many complaints. Rated 5 out of 5 by Anonymous from Great camera! Bought this for a field camera at work. We need to take photos of large areas from on the ground as well as aerial photos, so this camera is great since it has both panorama and zoom. we haven't tested the built in GPS yet, but we're hoping it will be a great asset. the photos this camera takes are excellent quality and it's pretty quick. the burst mode is a little hard to work with, but i was also trying it at extreme zoom without a tripod, so i didn't expect the best- it actually performed better than expected all things considered. love the vivid colors and the speed, and the sony panorama function is the best! it does pretty well with macro as well. Rated 1 out of 5 by Anonymous from Sony needs to fix E62:10 problem I bought this camera twice. First time I went to East Africa, on the way back it started to show E62:10. Then I got busy forgot about it. When I had time to look at it, it was already out of warranty. Second time I thought maybe I had bad luck the first time. With all the extra batteries, charges, I ordered another one for my trip to UK. It arrived a day before my departure. Out of the box, when I turned on for the first time, it showed E62:10. Luckily I bought from B&H, I returned unused. I searched on line, many people had this problem for so many years now. Sony: please fix your problem if your company name means anything to you! It takes a long time to establish, it takes no time to trash the company name. Rated 5 out of 5 by SAL from Definitely a good choice for long zoom and light weight Geared up for the wildebeest migration in Masi Mara and gorilla stalking in Rwanda. Excellent choice for easy to carry camera that still get great shots. The nits that Sony could/should fix: (1) no way to connect the lens cap -it'll be lost in ten minutes! (2) need better how to use manual. The downloaded version contains lots of lists and tech specs -- but no where does it really explain how to use all the wonderful settings. I am certain that I am missing out on lots of the great things this camera uses. There are dozens of videos on line that tell you why you should buy this camera -- but I have found nothing that tells you how to use it. does this camera have a view finder other than via the display? DSC-HX400V also has an electronic viewfinder A 201-dot resolution electronic viewfinder gives you a clear, real-time preview with 100% frame coverage &ndash; ideal for framing, focusing, and reviewing shots. A built-in eye-sensor automatically switches you between the LCD display and the viewfinder. Does this camera have a flash? Also can a Sony DSC-HX200V accept a close up lens kit +1 +2 &amp; +4 that can be placed over the lens either by screw it in or ANY other Way possible ? Also CAN this camera accept and use the Diopter kit +1 +2 &amp; +4. Would like to use this to take pictures of old pictures close up. If this can be done on either camera what is the B&amp;H order number for this item ? THANK YOU. Can this camera zoom while geting vedio? Yes you can zoom while take video. I do not believe this answer to be correct! 55mm filter may be used! How much internal memory does the HX400V possess for installation of apps? There is no internal memory on the Sony Cyber-shot DSC-HX400V, and this camera does not use apps. I asked earlier about amount of memory in Sony HX400V camera for running apps and was told it didn't have any memory and it didn't run apps. Please explain the following info on this website. https://www.playmemoriescameraapps.com/portal/usbdetail.php?eid=IS9104-NPIA09014_00-000003 It has the HX400V listed as a compatible camera and I have read reviews by owners of this model explaining their use of the time lapse app. The app is actually installed onto a smartphone or tablet to enable the use of WiFi connectivity with the camera, and not on the camera itself. When you install the PlayMemories app onto your device, you will be able to remotely trigger the camera, as well as other features that are provided by the PlayMemories app, since the Sony HX400V has built-in WiFi. To dual record both movies and still images at the same time, begin recording your movie by pressing the movie button. Then, while you are recording, press down the shutter button to record stills. There is no specific memory card needed to use this function. Can the sony wireless ECM AW3 Bluetooth wireless microphone be used on DSC-HX400V? If not can you recommend one that does. Thank you.